It seems as though when you reach a certain age in your twenty-somethings one of the most popular questions is are you in a relationship. Asking a person’s relationship status has become as standard as asking what they do for a living. I can say that I get asked this quite often by coworkers, family members, and other people that want to poke around in my life for fun. I have also felt the pressure of feeling as if I am supposed to have a significant other based on what other people around me were doing. Multiple articles pointed towards the difficulty of dating mixed with social media making it seem like it was impossible to find a good man, and if I did, I had won a prize that was similar to the highly coveted stuffed animals at your local carnival. Having a partner became more of an accomplishment than just something that happens. I became less of the prize and more of the game player that was spending copious time and efforts trying to win what I thought was this grand reward. To my astonishment, that never worked. I would “win the prize” but once I got it, many of the times it wasn’t really what I wanted. It was great to say that I had it, but it wasn’t as amazing as what I expected it to be. When I thought of myself as less than the prize, I was valued less, was treated like less, and ultimately received less. I decided to take the same energy I was investing in dating men and trying to be the “perfect choice” for a girlfriend, into loving myself. 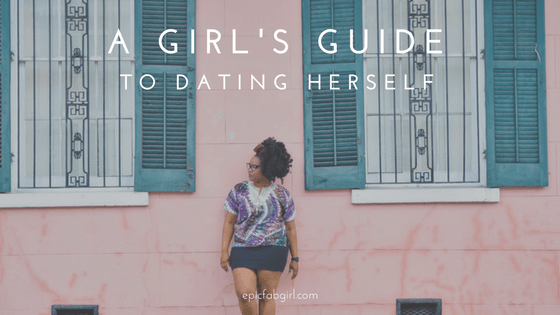 I had to learn how to date myself. How could I expect someone better than I was treating myself? I had to learn how to do exactly that. This is imperative. If you aren’t happy spending time alone, you won’t be happy with someone else. Spend time without your phone, social media, computer, etc. Sit and be still with just yourself. Just as we appreciate the small things in a relationship, you should have that same expectation for yourself. Buy a new lipstick. Make a great meal. Write yourself notes and leave them on your mirror. Get your hair done. A massage. Small reminders of self-love can make your day. For instance, I buy myself flowers every Sunday. I don’t spend a lot but it is something small that I look forward to every week. I know this one seems awkward, but take yourself out to lunch, the movies, dinner, etc. A lot of people hate doing dinner alone or things of that nature, but it’s something I highly suggest doing. Sit at the bar if you feel more comfortable. When I tell people this their first reaction is “I don’t want to look like the lame single girl sitting at the bar.” Well, you are single, but to be honest no one is paying that much attention to you while you are eating your $50 steak and $15 martini. Love on yourself as much as you can. Encourage yourself. Say to yourself that you are beautiful, you are wonderful. Walk by your mirror and say girl you look good today. That self-love radiants from inside out. When you have that Queen, no one can shift your crown.